I'm starting to try and get Blake more into his role play toys and trying to get him to enjoy using his imagination more. From a young age Blake has had his own toy phone and we got him his own toy kitchen for his 2nd birthday. He even has the Leapfrog number loving oven which he loves playing with. 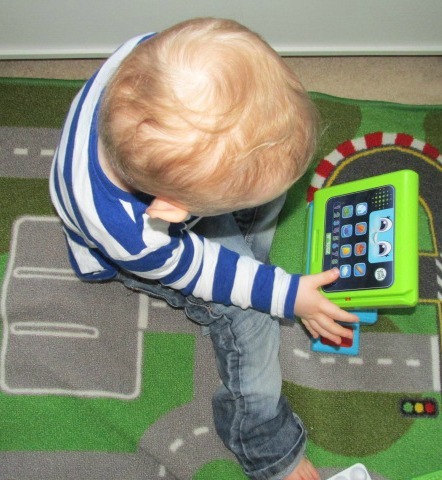 We recently got sent the Leapfrog count along till which I knew would be a hit with him. The Leapfrog count along till comes with 8 colorful food pieces, 10 coins and a shopping card. When you press the buttons on the till it talks about the colors as well as numbers and counting. In total the till says over 50 phrases and educational songs to help aid with learning. When you have "scanned" the items press the total button and the till will tell you how many coins the total is. You can either put the coins through the little slot as a self service till or if you press the red button it opens up the till so it can be used when playing with others as a shopkeeper/customer scenario. At the side of the screen is a slot for swiping the card for card transactions or i guess can be used a reward me card. The count along till like all of the Leapfrog toys Blake owns has two volume settings. The till also takes 3x AAA batteries which are also included. Blake loves the till with its cheery voice and loves scanning his shopping. I am hoping that the toy will also help to encourage him with his speech as well as color and number recognition and counting skills. The Leapfrog count along till retails at £19.99 and sold in most well known toy shops and Amazon. Oh, this is such a cute till. My toddler would enjoy something like this. 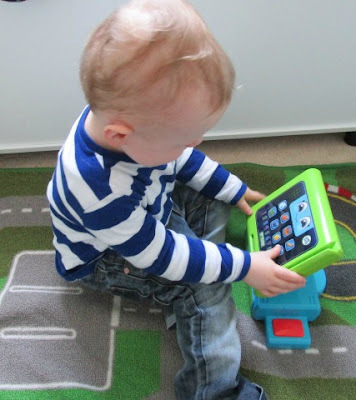 We have a few Leapfrog toys and have always been impressed with them. They are great for learning through playing. Ah my three love to play shop - my youngest is obsessed with her little wooden till. She says "you be the payer"
What a lovely toy it looks really educational and your little one is really enjoying it. This looks so fun! I wish I had a toy like this when I was a kid! My children love a toy till but we haven't seen this one! It looks great and very robust! I'm a huge fan of Leapfrog products! They offer so many different learning experiences for children and are a trusted brand in my household. This set is adorable! Brilliant toy, Leapfrog do great toys. I would have loved something like this as a child! That is an awesome toys.. it's great when toys and playtime become educational. All kids seem to love playing with those toy tills - I know mine did! I love this has the added bonus of teaching to count. Looks educational and fun - I know I used to adore anything with toy coins when I was little! What a good stuff for my kids I bet this would be perfect to my son. Thanks for the good review. That's really good value. Leapfrog always have great educational toys. Oh my son would love this! more so, he would love carrying the coins around trying to buy everything in his sight! Oh this is so cute. My little till was my favourite toy as a kid, looks like it's had quite an upgrade. My wee cousin used to love playing with his leapfrog pad. This looks a great toy!